The all-time “fishing high” continues for SoCal anglers and the anticipation of another amazing fishing season is building. A big part of that excitement will be the 13th Annual Yellowtail Shootout Tournament presented by Costa. Put June 21st, 22nd & 23rd down as the Yellowtail Shootout in your 2019 calendar. Of course we would like to give thanks to all of our great sponsors who share their time and great products to reward those who won both in fishing and in raffles. A special thanks to Costa, the headline sponsor now for the Yellowtail Shootout Tournament seven years running. We will once again offer special TowBoatUS San Diego jackpots! $2500 side jackpots for the largest tuna and $2500 side jackpot for the largest yellowtail by a BoatUS member boat. Details to come! 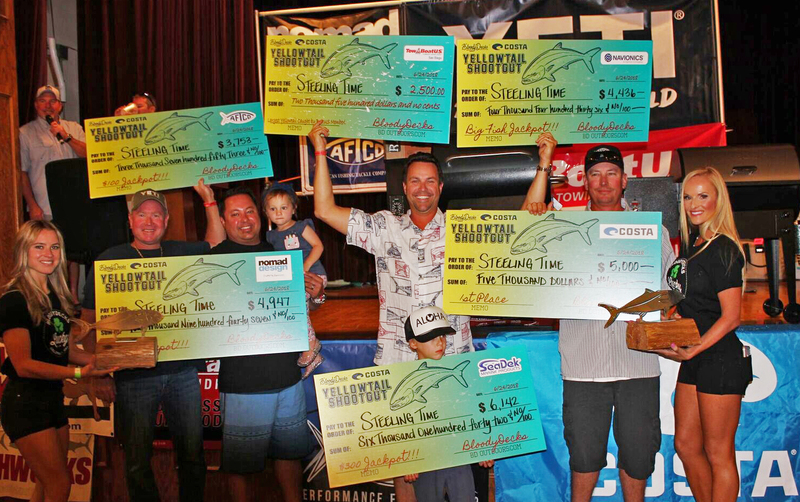 The Yellowtail Shootout Tournament awards and banquet will be held at Portuguese Hall in San Diego and a feast of BBQ and good times will be provided to tournament anglers. So Save the Date for great fishing, friendly competition and great prizes and food at the 2019 Yellowtail Shootout!